Are you are carrying adequate insurance should a loss occur from fire, theft, or other disasters? Get It Together LA! provides complete documentation services for Household Inventories. Filing a claim can be a traumatic experience after a loss. Insurance agents will tell you that the more detailed and accurate information available to adjusters will make the claim process easier. 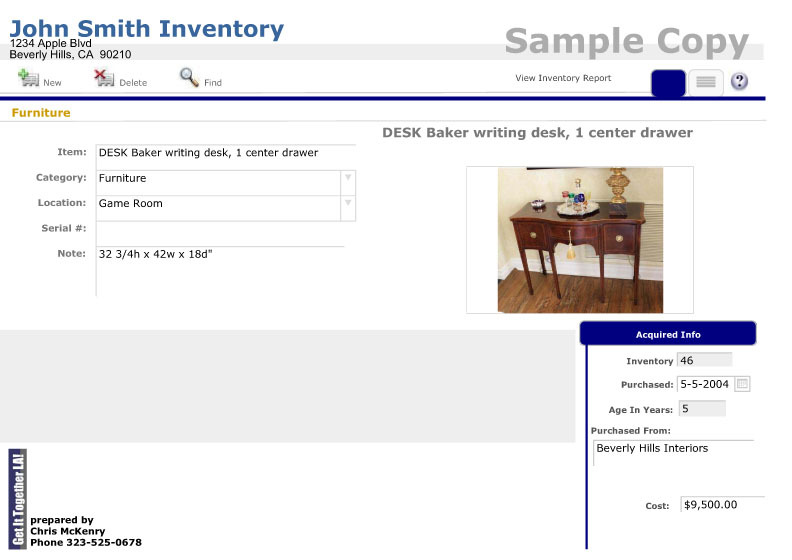 Assessments for Household Inventories include photographs, location of items, date purchased, purchase source, serial numbers, category and purchase cost. The finished product is available in both print and digital format. Information is sorted by both category and location, making retrieval of individual items easy. Protect your jewelry, furniture, silver and all household possessions with an accurate inventory from Get It Together LA!. Contact us at 323-525-0678 and let us share how we will help you protect your home.